America may spend $1 trillion or more to repair its crumbling infrastructure over the next decade, fueled by $137 billion in tax credits, according to this report. Along with creating nearly 200,000 jobs, this plan to fix aging bridges, roads, and water ways will create tons and tons of waste material. All those mountains of concrete slabs and towering piles of rebar will need to be hauled away. That’s a Herculean effort manual wheelbarrows just weren’t built for, unless of course your crew has a few of Zeus’s kids on it. For all us mere mortals, there is a tool out there that will give your team the super strength to get any material waste removal job done. 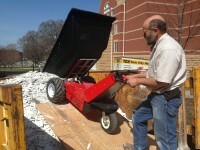 It’s called the Power Pusher E-750 Electric Wheelbarrow, and allows any worker to transport loads up to 1,000 lb. at 4 mph. According to a 2007 BLS report, almost 10% of the private industry workforce, or 371,000 people, is non-fatally injured per year, with 28% missing more than a month. Using a manual version, you could easily succumb to any of these. And even without injuries, productivity is severely limited. A worker may only be able to carry a few hundred pounds at a time and going back and forth and dumping each load becomes physically exhausting. With the E-750, the 1.6-hp, 1,200-w motor, powered by a 24-v battery, does all the work going back and forth from the worksite to disposal area, as well as lifting the 12-ft³ bed. The wheelbarrow runs an average of 5 miles on one charge, plenty of juice for an 8 to 12-hr shift, though Blesi says during an arena job, the battery lasted for 18 hr. 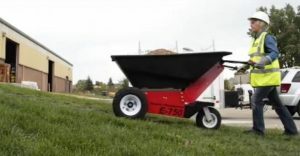 Overall, the efficiency boosts could quickly offset the price tag, which is fairly higher than your average Home Depot manual wheelbarrow. [Editor’s Note: You can also rent the E-750 through Home Depot and other equipment providers, Nu-Star says]. Even a one-person operation can see immediate dividends. 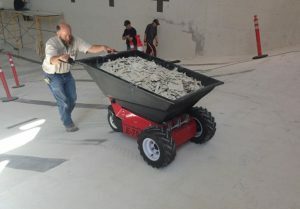 Jim Ashwell, the owner of flooring removal business in Minnesota had to remove 25 tons of ceramic tiles from an indoor pool, and sought out the E-750 after hearing about it from another construction company. The safety features, and what they prevent, far outweigh the lifting capacity, though. The release throttle stops and brakes the machine to prevent rollback and a Deadman’s lever on the other handle cuts power when released. “You cannot operate the equipment unless you have two hands on it at all times,” Blesi says. For a job such as diving into a pool floor to haul out tiles, as Ashwill had to do, choosing between a powered model and human locomotion isn’t really a choice at all. “The ramp was really steep, and really slippery, but the electric wheelbarrow went up smoothly with no problems at all,” Ashwill says. Jeff Ashwill is a one-man wrecking crew, and the E-750 makes sure he doesn’t wreck his knees or back in the process. The tires are foam-filled, so any outdoor site full of hazardous sharp obstacles won’t slow the E-750 down, but it’s indoors where the motorized tool proves most advantageous. That company that recommended the electric wheelbarrow to Ashwill, McGough Construction, used the E-750 to demolish and remodel a facility for one of the world’s largest food manufacturers. “Because it was an occupied space with people in it day in and day out, we knew a key challenge would be to complete the project with minimal interruption,” reports Jim Conn of McGough Construction. The quiet operation and quick pace of the battery-operated machine ensured noise would be less of a distraction. Battery operation also means zero emissions, another key to safe use inside. It’s up to Washington D.C. how many tax breaks and how much funding companies will get to help restore America’s foundation and renovate its manufacturing base, but Blesi is confident the E-750 is up to the task. “With the build-up of infrastructure over these next however many years, for any renovations that you’re doing inside plants or facilities, these would be ideal because you’re staying compliant with indoor work environment regulations,” Blesi says.